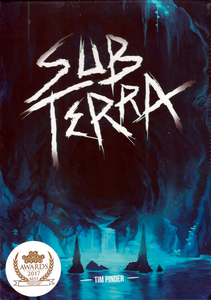 In Sub Terra, 1-6 players work together to survive and escape the cave! Escape an unexplored network of subterranean tunnels , ohhh the lights are flickering, there are things in the dark......Get to safety! Point to Point "Press Your Luck"
Player elimination is a part of Sub Terra, but it doesn’t have to be permanent. Other players can come to your aid and heal you. Objective of the game is to find the exit tile and escape with as many living team mates as possible! The coolness factor is that the tiles and the die glow in the dark!